You can weigh in as many animals as you'd like at the initial weigh in for only $5 each. Please remember all loading and unloading of animals is the responsibility of the owner at the initial weigh in. No COOL forms are needed for the 2019 Season. We appreciate the support of everyone that contributes in the support of our 4-H and FFA Livestock Auction. To find a list of our supporters, select DONATIONS above and scan down the page. Save the date! The 2019 MCJLA Auction will be July 13, 2019 - See you there! If you would like to donate to our awards or scholarships, click on the icon Donations (above) and select the appropriate Donation Form. Follow the instructions for mailing as designated on the form. 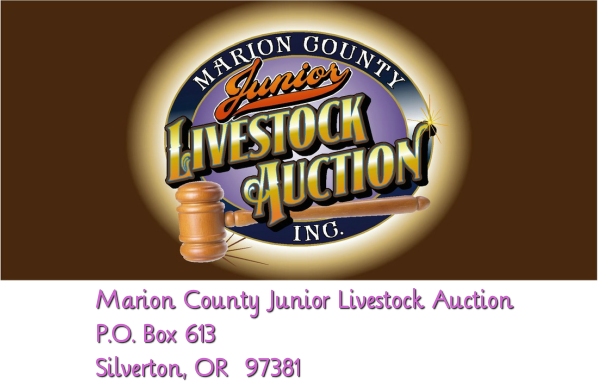 Marion County Junior Livestock Auction (MCJLA) is a nonprofit organization committed to help with and provide a positive learning experience for Marion County 4-H and FFA youth to sell their market animal at the Marion County Fair. If you have any question, comments, or concerns, please email us at the address above or use the contact form under the "more...." tab above. Effective December 7, 2011, MCJLA has been determined by the Internal Revenue Service to be exempt from Federal income tax under section 501 (c) (3) of the Internal Revenue Code and qualified to receive tax deductible bequests, devises, transfers or gifts and further classified as a public charity.